How to Cite This Chapter: Jolly SS, Mulloy A, Budaj A, Bednarz B, Leśniak W. Non–ST-Segment Elevation Myocardial Infarction. McMaster Textbook of Internal Medicine. Kraków: Medycyna Praktyczna. https://empendium.com/mcmtextbook/chapter/B31.II.2.5.3.1 Accessed April 19, 2019. 1. Symptoms: Chest pain or equivalent ischemic discomfort (features: see Stable Angina Pectoris). Unlike in stable coronary artery disease (CAD), the pain is not relieved within 5 minutes of removing the precipitating factors or administering sublingual nitrate, but it lasts longer and may occur at rest. 1) Angina occurring at rest, lasting >20 minutes. 2) New-onset angina within the prior month, Canadian Cardiovascular Society (CCS) class III (Table 1 in Stable Angina Pectoris). 3) Angina with a crescendo pattern: Angina that is becoming more frequent, is caused by less intense physical exertion than previously, lasts longer, has increased by at least one CCS class, and is at least CCS class III. Clinicians should assess the likelihood that signs and symptoms represent an acute coronary syndrome (ACS). This is an important step in the assessment of patients with a possible ACS, as it helps to avoid unnecessary invasive procedures in patients with a low likelihood of ACS. Patients with a history of obstructive CAD have a higher likelihood of presenting symptoms related to ACS (Table 2 in ST-Segment Elevation Myocardial Infarction). The second step is to assess the risk of adverse events. Standardized risk scores are available, for instance, Global Registry of Acute Coronary Events (GRACE) score (Table 1) or Thrombolysis in Myocardial Infarction (TIMI) NSTEMI score (www.timi.org/index.php?page=calculators). 1. Resting electrocardiography (ECG): Abnormalities may be observed in ≥2 contiguous leads (groups of contiguous leads include: V1-V6, anterior leads; II, III, aVF, inferior leads; I, aVL, lateral/apical leads; V3R, V4R, supplemental leads covering the free wall of the right ventricle). 1) ST-segment depression (less commonly, transient ST-segment elevation): Abnormalities of diagnostic value are new horizontal or downsloping ST-segment depressions ≥0.05 mV. 2) T-wave inversion (>0.1 mV; inversions ≥0.2 mV are associated with higher risk) or reversal of a prior T-wave inversion. T-wave flattening is relatively nonspecific. 3) ECG is normal in 30% to 50% of patients. 1) Cardiac-specific troponin T (cTnT), troponin I (cTnI), or high-sensitivity troponin I or T.
2) Creatine kinase MB subunit (CK-MB) concentration (CK-MBmass) >510 microg/L (depending on the assay); this is used only when cardiac-specific troponin measurements are not available. CK-MB activity and myoglobin concentrations are no longer used in the diagnostic workup of MI. 3. Chest radiographs may reveal signs of other diseases that may have caused angina or features of heart failure. 4. Resting echocardiography may reveal regional wall motion abnormalities or other etiologies of chest pain, such as valvular heart disease, including aortic stenosis or hypertrophic cardiomyopathy. 5. Coronary angiography reveals lesions located in the coronary arteries that are responsible for UA/NSTEMI or STEMI (usually arterial occlusion) and determine the optimal form of revascularization. Routine coronary angiography has been shown to be beneficial in moderate- to high-risk patients and should be performed. In patients presenting with acute chest pain, differential diagnosis includes but is not limited to aortic dissection, pulmonary embolism, myopericarditis, and musculoskeletal chest pain. The term “myocardial infarction” does not include the death of cardiomyocytes due to mechanical injury (eg, in the course of coronary artery bypass graft [CABG]), renal failure, heart failure, cardioversion, ablation, sepsis, myocarditis, cardiac toxins, or malignancy. 1) Percutaneous coronary intervention (PCI)-related MI: Elevation in troponin values (>5 × 99th percentile of the upper reference limit [URL]) in patients with normal baseline values (≤99th percentile of URL) or a rise in troponin values >20% (if the baseline values are elevated and are stable or falling) plus signs of myocardial ischemia or evidence of ischemia found on ECG, angiography, or imaging. 2) MI associated with CABG: Elevation in troponin values (>10 × 99th percentile of URL) in patients with normal baseline troponin values (≤99th percentile of URL), plus new pathologic Q waves or new left bundle branch block, an angiographically documented new graft or a new native coronary artery occlusion, or imaging evidence of a new loss of viable myocardium. 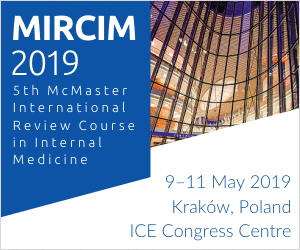 Treatment of high-risk patients in an intensive cardiac care or coronary care unit or equivalent; high-risk patients can be transferred to a nonintensive care ward after 24 hours of being free of the symptoms of myocardial ischemia, significant arrhythmias, and hemodynamic instability. 1. Monitoring: Continuous ECG monitoring for 24 hours after admission and further monitoring depending on clinical status and ongoing ischemia. 1) Risk scores, eg, GRACE (Table 1) or TIMI (www.timi.org/index.php?page=calculators) scores. 1) High-risk patients (GRACE score >140, a defined increase in troponin levels, or dynamic ST-segment or T-wave changes) and intermediate-risk patients (recurrent symptoms or additional high-risk factors) without contraindications for invasive procedures benefit from a routine coronary angiography, which is recommended.Evidence 1Strong recommendation (benefits clearly outweigh downsides; right action for all or almost all patients). High Quality of Evidence (high confidence that we know true effects of the intervention). Mehta SR, Cannon CP, Fox KA, et al. Routine vs selective invasive strategies in patients with acute coronary syndromes: a collaborative meta-analysis of randomized trials. JAMA. 2005 Jun 15;293(23):2908-17. PubMed PMID: 15956636. High-risk patients (GRACE score >140) should have an early invasive approach (ie, within 24 hours if possible).Evidence 2Strong recommendation (benefits clearly outweigh downsides; right action for all or almost all patients). High Quality of Evidence (high confidence that we know true effects of the intervention). Mehta SR, Granger CB, Boden WE, et al; TIMACS Investigators. Early versus delayed invasive intervention in acute coronary syndromes. N Engl J Med. 2009 May 21;360(21):2165-75. doi: 10.1056/NEJMoa0807986. PubMed PMID: 19458363.Patients with refractory or recurrent angina accompanied by ST-segment depression (≥2 mm) or deep T waves, heart failure, hemodynamic instability (shock), or life-threatening arrhythmias (ventricular fibrillation or ventricular tachycardia) should undergo an early invasive approach as well. 2) Low-risk patients are those with no recurrent chest pain, without symptoms of heart failure, without abnormal ECG findings, and with normal cardiac troponin (or any other appropriate marker of myocardial necrosis) levels. The determination should be made whether these symptoms are related to ACS or a noncardiac cause. Low-risk patients may have a noninvasive assessment, and if it is normal or low risk, they may be treated medically. Low-risk patients with the classical description of low-threshold angina should undergo an invasive assessment. 3. Oxygen should be administered to each patient with hypoxia. Monitor saturation using pulse oximetry and assess blood gases in patients with abnormal results. The use of oxygen in patients without hypoxia may be detrimental.Evidence 3Low Quality of Evidence (low confidence that we know true effects of the intervention). Quality of Evidence lowered due to indirectness of populations and outcome measures. Stub D, Smith K, Bernard S, et al; AVOID Investigators. Air Versus Oxygen in ST-Segment-Elevation Myocardial Infarction. Circulation. 2015 Jun 16;131(24):2143-50. doi: 10.1161/CIRCULATIONAHA.114.014494. PubMed PMID: 26002889. 1. Nitrates can be used to relieve chest pain and are for symptomatic use only. Sublingual nitroglycerin can be given to acutely relieve chest pain but if the chest pain is ongoing, intravenous nitroglycerin can be considered (loading dose of 5-10 microg/min, increased by 5-20 microg/min every 3 to 5 minutes until the resolution of pain or development of adverse effects [headache or hypotension]). Dosage, contraindications, and adverse effects: see Stable Angina Pectoris. 2. Beta-blockers should be used in patients to relieve angina and should be considered in all cases unless a contraindication exists (resting bradycardia, active wheezing).Evidence 4Weak recommendation (benefits likely outweigh downsides, but the balance is close or uncertain; an alternative course of action may be better for some patients). High Quality of Evidence (high confidence that we know true effects of the intervention). Bangalore S, Makani H, Radford M, et al. Clinical outcomes with β-blockers for myocardial infarction: a meta-analysis of randomized trials. Am J Med. 2014 Oct;127(10):939-53. doi: 10.1016/j.amjmed.2014.05.032. PubMed PMID: 24927909.Oral dosage, contraindications, and adverse effects: see Stable Angina Pectoris. 3. Calcium channel blockers are indicated in patients with persistent or recurrent myocardial ischemia in whom beta-blockers are contraindicated. Use diltiazem or verapamil (unless the patient has severe left ventricular dysfunction or other contraindications). If treatment with nitrates and beta-blockers at the highest tolerated doses does not control ischemia, a long-acting dihydropyridine calcium channel blocker may be added (do not combine diltiazem or verapamil with beta-blockers). Dosage, contraindications, and adverse effects: see Stable Angina Pectoris. 4. Angiotensin-converting enzyme inhibitors (ACEIs): Starting an ACEI within 24 hours is indicated in all patients with no contraindications.Evidence 5Strong recommendation (benefits clearly outweigh downsides; right action for all or almost all patients). High Quality of Evidence (high confidence that we know true effects of the intervention). Yusuf S, Sleight P, Pogue J, Bosch J, Davies R, Dagenais G. Effects of an angiotensin-converting-enzyme inhibitor, ramipril, on cardiovascular events in high-risk patients. The Heart Outcomes Prevention Evaluation Study Investigators. N Engl J Med. 2000 Jan 20;342(3):145-53. Erratum in: 2000 May 4;342(18):1376. N Engl J Med 2000 Mar 9;342(10):748. PubMed PMID: 10639539. In case of ACEI intolerance, an angiotensin receptor blocker (ARB) may be used. Drugs: Table 5 in Essential Hypertension; dosage: Table 4 in Stable Angina Pectoris. 5. Morphine: 3-5 mg IV in patients with severe persistent chest pain despite the use of the treatments described above. 6. Statins should be used in every patient unless contraindicated, regardless of the plasma cholesterol levels, optimally within 1 to 4 days of admission. Target low-density lipoprotein cholesterol levels are <1.8 mmol/L (70 mg/dL). High-dose statins should be used to prevent recurrent events.Evidence 6Strong recommendation (benefits clearly outweigh downsides; right action for all or almost all patients). High Quality of Evidence (high confidence that we know true effects of the intervention). Cannon CP, Braunwald E, McCabe CH, et al; Pravastatin or Atorvastatin Evaluation and In-fection Therapy-Thrombolysis in Myocardial Infarction 22 Investigators. Intensive versus moderate lipid lowering with statins after acute coronary syndromes. N Engl J Med. 2004 Apr 8;350(15):1495-504. Erratum in: N Engl J Med. 2006 Feb 16;354(7):778. PubMed PMID: 15007110. Agents and dosage: Table 2. 1) Acetylsalicylic acid (ASA) is used in all patients suspected of ACS unless contraindicated.Evidence 7Strong recommendation (benefits clearly outweigh downsides; right action for all or almost all patients). High Quality of Evidence (high confidence that we know true effects of the intervention). Randomised trial of intravenous streptokinase, oral aspirin, both, or neither among 17,187 cases of suspected acute myocardial infarction: ISIS-2. ISIS-2 (Second International Study of Infarct Survival) Collaborative Group. Lancet. 1988 Aug 13;2(8607):349-60. PubMed PMID: 2899772. 2) P2Y12 inhibitor therapy should be used in combination with ASA for 12 months. On presentation, ticagrelor or clopidogrel should be given; the decision may be based on the patient’s underlying bleeding risk. In a direct comparison, ticagrelor was associated with a reduced rate of death, MI, and stroke but an increased rate of non-CABG major bleeding.Evidence 8Moderate Quality of Evidence (moderate confidence that we know true effects of the intervention). Quality of Evidence lowered due to imprecision. Wallentin L, Becker RC, Budaj A, et al; PLATO Investigators, Freij A, Thorsen M. Ticagrelor versus clopidogrel in patients with acute coronary syndromes. N Engl J Med. 2009 Sep 10;361(11):1045-57. doi: 10.1056/NEJMoa0904327. PubMed PMID: 19717846.At the time of PCI, prasugrel can be used in addition to aspirin in patients without an increased risk of bleeding.Evidence 9Strong recommendation (benefits clearly outweigh downsides; right action for all or almost all patients). High Quality of Evidence (high confidence that we know true effects of the intervention). Wiviott SD, Braunwald E, McCabe CH, et al; TRITON-TIMI 38 Investigators. Prasugrel versus clopidogrel in patients with acute coronary syndromes. N Engl J Med. 2007 Nov 15;357(20):2001-15. PubMed PMID: 17982182. Discontinue clopidogrel or ticagrelor for 5 days and prasugrel for 7 days prior to CABG unless the benefits of urgent revascularization outweigh the risks bleeding. Ticagrelor and prasugrel should not be used in patients with a history of hemorrhagic stroke or advanced liver disease. If ticagrelor or prasugrel cannot be used, treat the patient with clopidogrel. 2. Anticoagulant therapy should be used in every patient with a documented ACS. Options for anticoagulant therapy include fondaparinux (2.5 mg subcutaneously daily),Evidence 10Strong recommendation (benefits clearly outweigh downsides; right action for all or almost all patients). High Quality of Evidence (high confidence that we know true effects of the intervention). Fifth Organization to Assess Strategies in Acute Ischemic Syndromes Investigators, Yusuf S, Mehta SR, Chrolavicius S, et al. Comparison of fondaparinux and enoxaparin in acute coronary syndromes. N Engl J Med. 2006 Apr 6;354(14):1464-76. PubMed PMID: 16537663.enoxaparin (1 mg/kg subcutaneously bid),Evidence 11Strong recommendation (benefits clearly outweigh downsides; right action for all or almost all patients). High Quality of Evidence (high confidence that we know true effects of the intervention). Antman EM, McCabe CH, Gurfinkel EP, et al. Enoxaparin prevents death and cardiac ischemic events in unstable angina/non-Q-wave myocardial infarction. Results of the thrombolysis in myocardial infarction (TIMI) 11B trial. Circulation. 1999 Oct 12;100(15):1593-601. PubMed PMID: 10517729.or intravenous unfractionated heparin (UFH).Evidence 12Weak recommendation (benefits likely outweigh downsides, but the balance is close or uncertain; an alternative course of action may be better for some patients). Moderate Quality of Evidence (moderate confidence that we know true effects of the intervention). Quality of Evidence lowered due to imprecision. Collins R, MacMahon S, Flather M, et al. Clinical effects of anticoagulant therapy in suspected acute myocardial infarction: systematic overview of randomised trials. BMJ. 1996 Sep 14;313(7058):652-9. PubMed PMID: 8811758; PubMed Central PMCID: PMC2351968.In a direct comparison, fondaparinux was associated with a reduced major bleeding risk compared to enoxaparin.Evidence 13High Quality of Evidence (high confidence that we know true effects of the intervention). Fifth Organization to Assess Strategies in Acute Ischemic Syndromes Investigators, Yusuf S, Mehta SR, Chrolavicius S, et al. Comparison of fondaparinux and enoxaparin in acute coronary syndromes. N Engl J Med. 2006 Apr 6;354(14):1464-76. PubMed PMID: 16537663. In patients treated with fondaparinux, use UFH 85 IU/kg for anticoagulation during PCI. Anticoagulant therapy is usually discontinued after PCI unless there are additional indications, such as increased risk of thromboembolism. In patients receiving conservative treatment, anticoagulant therapy may be continued until discharge or to a maximum of 8 days, whichever comes first. In patients with ongoing angina after medical treatment, perform coronary angiography with no prior noninvasive studies. 3. Pharmacotherapy (specific indications, including antiplatelet agents [ASA and/or clopidogrel or prasugrel or ticagrelor], beta-blockers, ACEIs [or ARBs], aldosterone antagonists, statins: Table 6 in ST-Segment Elevation Myocardial Infarction). 4. Anticoagulant treatment is recommended after coronary stenting in patients with atrial fibrillation and a moderate to high risk of thromboembolic complications. Treatment with a vitamin K antagonist is indicated ([Table 6-8 in Atrial Fibrillation]). a Risk factor assessed at discharge only. CABG, coronary artery bypass graft; MI, myocardial infarction; PCI, percutaneous coronary intervention. a In patients with renal failure, use unfractionated heparin. b Patients with renal failure require dose adjustment. c Consider dose reduction in elderly patients and patients with moderate renal insufficiency. Based on the 2007 and 2011 European Society of Cardiology guidelines. See Additional Information for details. aPTT, activated partial thromboplastin time; ASA, acetylsalicylic acid; bid, two times a day; IV, intravenous administration; PCI, percutaneous coronary intervention; ULN, upper limit of normal. Figure 1. 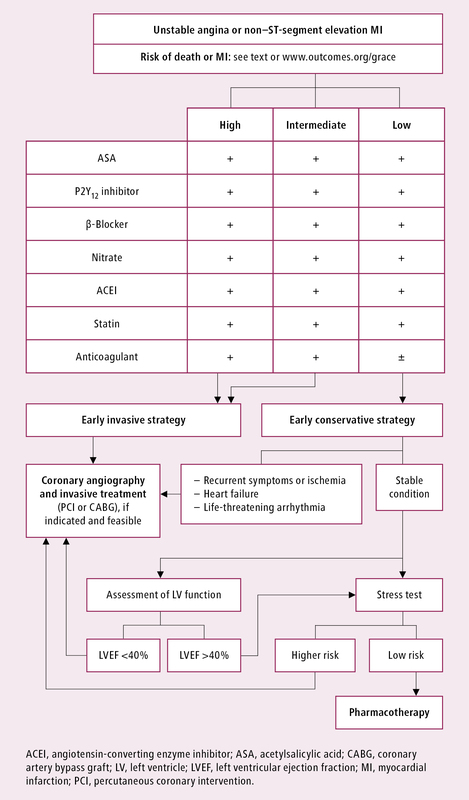 Management algorithm of unstable angina or non–ST-segment elevation myocardial infarction. Based on the 2007 and 2011 European Society of Cardiology guidelines (see Additional Information for details).